That’s the benefit of reconnecting with children as seen through the eyes of so many dads who’ve been absent from the lives of their children. Do you have advice for me on connecting with my child, a child I’ve never known and who doesn’t know me? Do you have advice for me on reconnecting with my child, a child I haven’t seen for many years? Educates dads on two stages they must pass through—with associated steps in each stage—to successfully connect with their child (under age 18) for the first time or to reconnect if once connected. Helps him learn not only what he must do but how he must do it—a process that will give him the best chance to succeed in connecting. As a conversation starter during one-on-one discussions with dads. To supplement a fatherhood program, such as 24/7 Dad® and InsideOut Dad®. They integrate it into sessions with topics that mesh well with the content in the brochure (e.g. communication and co-parenting). To supplement parenting and visitation plans. Place it in display racks in lobbies and staff offices. If you serve dads who long to reconnect with their children, please join these and other NFI partners in using this flexible, valuable resource. 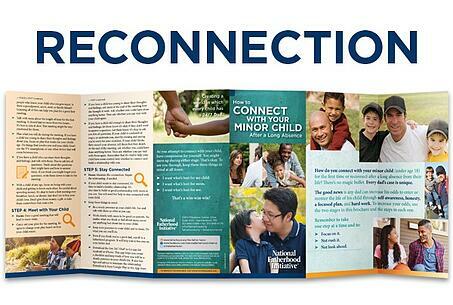 You can preview the entire content of the brochure here. Just click on the small thumbnail images of the brochure's content, which appear below the main image of its cover. Would you like to help dads reconnect with their children? Do any of the dads you serve struggle with the “how to” of reconnection?